Microsoft has announced a raft of new features to boost the security of Hotmail, including new ways to combat account hijacking. Announcing the new updates on its blog, John Scarrow at Microsoft explained: "We are releasing new features to safeguard everyone's account from hijackers. "These updates help you protect your password and, in the unlikely event that a hijacker gains access to your account, provide a more secure recovery path so you will always be able to get your account back and kick the hijackers out." There is now a single use code (a one-time password) that can be sent to your mobile phone, which can be used to log into your Hotmail account when you are on an unsecured computer. Two new kinds of proofs for account recovery have been introduced: A Trusted PC can now be assigned, so if you sign on using this PC, then it is likely it is you; there is also the option to get a secret code sent to your phone which can be used to reset your password and reclaim your account. You can also get access to one proof when your account has been locked, which means that hackers can't completely claim the account for their own. You can now change a proof and access your account this way. "Account security is more important than ever, and with this release, and Hotmail is making your email account more secure than ever," explained John Scarrow at the end of the blog. 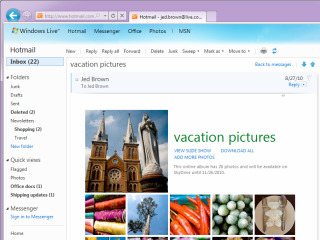 This is all part of a number of updates to the new Hotmail. Just last week, it was announced that Facebook Chat integration is coming to the email service.